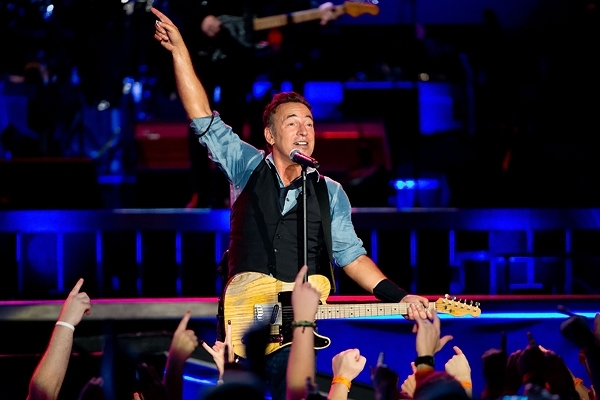 Bruce Springsteen is riding a post-convention bounce any politician would envy: Sales of "We Take Care of Our Own" jumped 409 percent after the song played at the end of President Obama's speech September 6th at the DNC, Billboard reports. The track sold 2,000 downloads in the week ending September 9th, for its best sales week since March. The tune leads off Springsteen's latest album, Wrecking Ball, which also saw a sales increase, of 3,000 copies, a 37-percent jump. Wrecking Ball was Springsteen's 10th Number One album, pulling him into a third-place tie with Elvis Presley for the most chart-topping albums. The Beatles have the most, with 19; followed by Jay-Z with 12.